Not every business operates year-round. If you run a business that shuts down in the winter you may need extra storage space to store your inventory, office supplies, and furniture. A.B. Richards will deliver a ground-level portable storage container to where you need it and we’ll give you the product that’s right for your needs. Let’s face it, winter can unexpectedly wreak havoc on your home. Heavy snow can damage roofs. High winds can ruin siding or break windows. Repairing major damage to your home isn’t easy. The Greater Fort Wayne Business Weekly points out that you should take pictures of the damage and prepare documentation for your home or rental insurance company. In the meantime, you’re going to need extra storage. A.B. Richards’ 20ft storage containers are small enough to fit in tight residential lots. If you run a business that’s open in the winter, you know that you need to keep your facility clear of snow and ice, to protect your employees and customers. If you need to clear a parking lot or pathways and sidewalks, you’re going to need snow removal equipment close by. Plows should be cleaned, greased, and disconnected before they go into storage, according to plow manufacturer Sno-way. You also need to keep it rust free. If you’re storing a large number of snow shovels, plows, and de-icing material, A.B. Richards’ 40ft storage containers can help you with large storage jobs. If the college student in your life is graduating, be prepared to take on a lot of belongings that you might not necessarily have room for. You may be dealing with a whole apartment’s worth of items. If you suddenly find yourself with a whole new set of furniture, clothing, and appliances with no place to put it all, try the 40ft Jumbo Container from A.B. Richards. Winter weather can be challenging and it can be particularly difficult if you have storage issues associated with it. A.B. 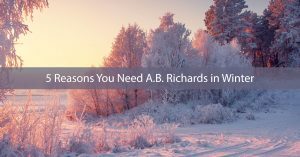 Richards can make your life a whole lot easier. In addition to delivering your container where you’ll need it, we’ll also pick them up when you’re done. Your stored items will be safe and secure. All of our storage containers are made of 14-gauge steel and can be padlocked. To get started, contact us today.